RIDGEFIELD PARK, NJ--(Marketwired - Mar 14, 2014) - The Gallery Collection, a leading publisher of personalized greeting cards, is proud to announce the winner of its 7th Annual Create-A-Greeting-Card scholarship contest. Jill Ma of North Waterboro, Maine will receive this year's $10,000 award for her submission. In addition to a personal scholarship, Catherine McAuley High School, Jill's school, will receive a $1,000 prize. 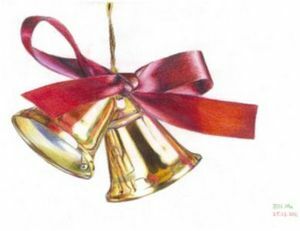 Jill's winning entry features her own creative vision of the classic holiday bells. The shimmering golden bells and the festive red ribbon that adorns them will create a holiday card that truly evokes the warm feeling of the season. Her beautiful design beat out thousands of other entrants to be crowned this year's winner. Jill's design, and all of the 2013 finalists, can be viewed on the Greeting Cards Winners and Finalists page on The Gallery Collection website along with the previous years' winners. Jill, a senior at Catherine McAuley High School, is currently planning to attend a five year dual program at the School of the Museum of Fine Arts in Boston where she plans on earning a BFA in Studio Art and a BS in Science or Math. "Winning this scholarship is wonderful! I honestly cannot believe that I am winning this scholarship." She continued, "As an international student, financial aid and work study opportunity is not commonly given. This scholarship is a huge relief for my parents financially. I'm also very glad that my high school will receive 1,000 dollars. My high school has done a great job educating their students." This marks the seventh consecutive year The Gallery Collection has hosted a greeting card design contest. High school and college students 14 years of age or older submitted original photos, paintings, drawings and graphic designs to be considered for the front of a greeting card. Thousands of entries were judged based on overall aesthetic appeal, quality of execution, creativity and suitability as a Gallery Collection greeting card and in the end, Jill's winning design was chosen. Jill will receive a $10,000 scholarship and her design will be made into an actual greeting card that will be added to The Gallery Collection's extensive line. Check out The Gallery Collection's blog to read how a previous year's winning design was turned into a Gallery card, or go to www.GalleryCollection.com to see the company's complete line of beautifully crafted greeting cards. About The Gallery Collection - Prudent Publishing's The Gallery Collection is a leading publisher of premium quality business greeting cards in the United States. Established in 1929 and still family owned, the company offers direct-from-the-publisher prices that include customized ink and foil imprints, a large selection of memorable greetings, and matching deckle-edged envelopes made of recycled paper. The Gallery Collection also offers an extensive array of business Christmas cards and personalized holidays cards, many of which are produced by wind power using environmentally friendly recycled paper stock. Jill Ma's winning Gallery Collection Create-A-Greeting-Card $10,000 Scholarship Contest design.